Little Piece of Heaven, better known as Lily, is a 13.2 hand, gray welsh cobb mare. Lily has no specific markings besides a double whorl on her face. Her previous owner is actually one of our very own trainers, Kristen Dalgleish! Lily has won many champion and reserve ribbons in multiple shows. Her most recent win was at the Lambanks show where she won champion in the 2'3" very lows with Kristen. Lily has also won many year end ribbons, including a reserve champion in the short stirrup division. Before Lily became such a winner in the hunters, she was used as a jumper pony. Though she may be tiny, she is definitely mighty! She has jumped up to 2'6" - 2'9". Lily is not currently a jumper pony, but has officially been a school horse at SaddleBack for almost three years now. She's proven to be quite an adventurous little pony! During the summer, she can sometimes be a little lazy but when winter comes, her true personality shines through. Lily is full of sweet surprises and keeps you on your toes! Watch out because she'll eat just about anything you put in front of her face, she has even eaten a bell once! Though she is technically a school horse now, she is still best friends with her old pasture pal, Angel. 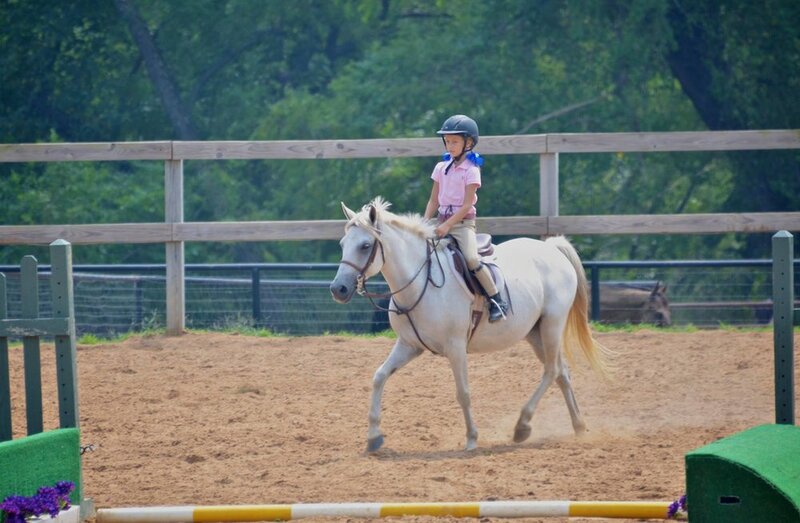 Lily is the perfect little pony for beginners - smaller advanced riders. If you're looking for a fun ride, don't miss out on this Little Piece of Heaven! She is available for lessons, leases, pony parties, and showing! SaddleBack has 12 school horses currently available for lessons, partial leases & showing. Lessons from: $40 group, $45 private. Partial Leases from: $275/month for all horse expenses. NEW SaddleBack Shop! Order SaddleBack merchandise online & have shipped to your home! Have you always wanted a SaddleBack polo or hat? Do you need a warm hoodie or fleece zip-up for the upcoming months? You can now order & pay for these directly online through a link on our website! Two Socks Designs has been providing SaddleBack merchandise to us for years, but now has an online site to order directly from them instead of waiting for our seasonal merchandise orders. We also have a list of our current on-hand merchandise including t-shirt as low as $5. Go to the website link below to see what items we are currently offering and to order online. How easy is that?! Fall show season is in full swing! Sign-up sheets for the remaining September-November shows are posted on the tack room window. If you ride a school horse and have a favorite horse you want to ride in a show(s), sign your name and preferred horse up ASAP as they are assigned on a 1st-come-1st-serve basis if not leased. One of the many perks of leasing a SaddleBack horse is that you are ALWAYS guaranteed your horse for lessons and shows AND save on horse rental fees. If you have any questions about shows or leasing a school horse, please contact SaddleBack or ask your trainer. SaddleBack Halloween Party: Sunday, October 29, 3-4:30pm: Come join us for a fun afternoon of costume parade, painted pumpkin display, games and candy/treats. The costume parade contest starts at 3:30pm in the Jumper Ring. Sign-ups will be posted on the tack-room window in early October. Sign up early as we had over 20 people signed up & participate last year! Bring your painted (not carved) pumpkin to display/be voted on, and we will later place the pumpkins around the arena and under jumps for all to enjoy during lessons the following week. We are offering prizes this year for the winning pumpkin and for each costume category! Hope to see everyone there! Congrats to SaddleBack Equestrian Riders at the River Run Show! Way to go ladies!! So proud of all our riders & horses! Congrats to our riders on a fantastic SummerFest show last month! Each of our riders took home at least 1 blue ribbon!! Savannah/Tuffy: won hunter round + multiple other ribbons Sun after Savannah sitting out Sat due to injury. Way to go ladies, & a big thank you to our amazing horses who were troopers despite the heat!! Congrats riders for SaddleBack Equestrian Summer Show! The SaddleBack In-Barn Summer Horse Show held on Saturday, August 26th was a great success! We had a great turnout and for many of our riders it was their very first show! Thank you to everyone that participated and came out to support. A Big Thank You to Mary Beach for providing water, Gatorade and snacks to both riders & staff! Charlie Cheesecake- School Horse of The Month! Charlie (aka Charlie Cheesecake) is a 16 year old, 16.1 hand, gray Thoroughbred gelding. Registered as Bold Meadow with The Jockey Club, Charlie has a star with connecting stripe and snip on his face. Before becoming a school horse at SaddleBack, Charlie had spent many years as a “pony horse” on the track. Pony horses are the horses you see in the pre and post parades. They're the horses accompanying the racehorse and jockey onto the track at race time. Pony horses are there for a number of reasons. At the beginning of each race, a pony’s rider reaches over to attach a lead to a nervous racehorse on the way to the starting gate. The racehorse might be young, anxious, distracted or just plain silly. The pony horse is often a calming presence, providing a safety net for both horse and jockey. SaddleBack purchased Charlie in 2013 because of this calming demeaning, non-spookiness (he’s seen it all at the track over the years), and willingness to try for his rider. Once at SaddleBack, Charlie started receiving training rides, learned how to be consistent with his leads, move off the leg, how to jump courses, and now has an auto flying lead change and is competitive at local Hunter Jumper schooling shows. He was Reserve Champion in the Long Stirrup Division in 2014 and has also had Year End awards in the the AC Short Long and 2’ Hunter Divisions. Last year, Charlie moved up to also compete in the the 2’3 Academy Beginners and has brought home many great ribbons for his riders ever since. Charlie has jumped up to 3' with ease, has a huge stride that easily gets down the lines, and an easy, auto flying lead change. Riders enjoy Charlie because he is not too fast or too lazy, doesn’t spook and is consistent. He’s great not only in our very beginner walk/trot lessons but also at teaching riders how to do flying lead changes and learn to jump. Charlie is currently available for lessons, partial lease, and showing. SaddleBack Summer Show - Saturday, August 26! The date of our Summer Show is just 4 weeks away! 3 jumping or ground pole classes (Hunter I, Hunter II, Equitation Over Fences/Poles): each individual rider does the assigned “course” over 6-8 ground poles or jumps depending on their division. Each class is placed individually (1st-8th place ribbons for each class). 2 non-jumping/pole “Flat” classes (Hunter Under Saddle & Equitation on Flat): together, riders, walk, trot (and canter only for those in the cantering division) both directions of the ring. Each class is placed individually (1st-8th place ribbons for each class). Leadline: for ANYONE 6 years of age or younger. Does NOT have to be a SaddleBack student—can be siblings, friends, neighbors, grandchildren, nieces, nephews, etc. These young riders will be led via leadline on one of SaddleBack’s school horses, walking only. Sign-up Sheets for this show (w/school horse reservations) are now posted up at the barn on the Tack Room window. Please sign-up ASAP to reserve your preferred school horse as they are on a first-come-first-serve basis. A $50 non-refundable deposit w/entry form is needed to reserve horse—refundable only if date change due to weather. *School Horses Available (12 total): Belle, Penny, Lily, Payday, Mac, Charlie, Brady, Bishop, Shadow, Beau, Kip, Nim. Each of the 12 school horses can do 2 divisions PLUS leadline. A Prize List with schedule/info and Entry Forms are posted at the barn or you can Email Us for a copy and we can email you pdfs of both. Please feel free to contact us with any questions. We’re looking forward to a wonderful show and hope everyone can participate! Fall Beginner Lesson Session Reminder! Fall session begins the week of Sunday, August 28th! This is a 13 week session offered to beginner students 7 days a week. Benefits include weekly 1 hour lessons at discount rates! Sign up soon while spots are still available. Go to the website link below for more info, dates/times, and to sign up and pay online. How easy is that?! SADDLEBACK EQUESTRIAN MADE THE NEWS!! KJRH 2 News recently covered a series on lesser known Olympic sports including Equestrian and chose to include SaddleBack and Ashley Zilmer along with a few students as part of the video footage for the story. The story made its debut on August 15th and a link to the story on KJRH's website is listed below. Newscaster Jeremy Muhui was even generous enough to include a special link to SaddleBack Equestrian's website in his online story! We are extremely proud to promote the sport and thank KJRH for giving SaddleBack staff and students this opportunity to represent our barn. Go team SaddleBack!! A BIG thanks to all for coming to SaddleBack BBQ! Fall show season is upon us! Sign-up sheets are posted on the tack room window. If you ride a school horse and have a favorite horse you want to ride in a show(s), sign your name and preferred horse up ASAP as they are assigned on a 1st-come-1st-serve basis if not leased. One of the many perks of leasing a SaddleBack horse is that you are ALWAYS guaranteed your horse for lessons and shows AND save on horse rental fees. If you have any questions about shows or leasing a school horse, please contact SaddleBack or ask your trainer. We wish all our riders a successful and fun fall show season! Fall merchandise orders will be going out soon. Be looking for order forms in the tack room. Items available for order this fall will be long-sleeve T-shirts, jackets, windpants, polos, and hats. Payments are due at time of order. SaddleBack accepts cash or checks ONLY for Fall Merchandise orders. We expect a faster turnaround time due to all items previously ordered last year. Warm Welcome to Our New Trainer! SaddleBack is excited to introduce our newest trainer to the SaddleBack team--Audra Glen! Audra is teaching new and existing students from beginner to jumping levels in schooling and rated shows. Click on the link below to view Audra's bio on our website. We are happy to have Audra on board! Belle (aka Southern Bell) is a 13 year old, 11.1 hand, Welsh pony mare. Bay in color, Belle has a star and snip on her face, 3 white pasterns, and 1 white coronet. Before becoming a school horse at Saddleback, Belle was owned by another riding barn up in the Northeast. During her time there, Belle was used as a school horse, where she won several ribbons in the short/long stirrup division, including blues, and even competed in the Devon horse show! Her previous owners purchased her after her school horse days as more of a leadline horse for their two young daughters. Being a military family, they moved around a lot and sweet Belle always went with them. But, when it came time for the family to move to Fort Sill, Belle sadly needed a new home. We found her and knew she would be a perfect fit at Saddleback when her owners told us she would stand completely still and quiet in the cross ties while the two daughters painted her hooves with nail polish! From there, Saddleback took her on as a lesson horse, retrained her to be a school horse again, and not just for the flat, but also for jumping lessons. Belle has been a pleasure to have at Saddleback Equestrian. She’s taught many young riders the basics, taken a few over their first fences, and continues to be a favorite among all ages. Belle is currently available for lessons, short/long stirrup showing, and lease options. IT'S NOT ALWAYS ABOUT THE RIBBONS. As fall show season is quickly approaching, a good reminder for all riders is this - it’s not just about the ribbons. The goal for most, if not all, riders is to leave a horse show with only blue, or first place, ribbons in hand. However, shows have so much more to offer than just shiny blue ribbons. Competing in horse shows can help you and your horse develop confidence, gain show experience, and learn what you can improve on for the next time you’re in the ring. Shows can be nerve-racking for riders of all ages and the only way to overcome the show day “jitterbugs” is to become confident in the ring. You might be overwhelmed by the more-experienced riders, the schooling ring packed with trainers yelling and everyone doing their own thing, or maybe even the thought of riding without your trainer walking you through every step of the way scares you. These fears, however, help develop deeper bonds and trust between horse and rider. When you’re afraid of all that a show entails, you have to trust that your horse will take care of you, and they learn the same from you. Creating this bond between you and your horse also helps both of you to feel more confident in the show ring. All the little details become less “scary” and you begin to relax, knowing what to expect, and that all you can give is your best. There are many factors that go into how well, and if, you place in a class or division. You are only in control of your attitude and actions throughout the show day. You can do numerous horse shows, performing consistently throughout the season, and still place all across the board. The overall placings are up to the judge. Instead of deciphering why you didn’t get first place for that one class or division from the show, try sitting down and talking with your trainer about what you did well in each round and where you can improve for the next round or horse show. SADDLEBACK EQUESTRIAN LAST SUMMER CAMP FOR SEASON! Sign up now for SaddleBack's last camp of the summer. We added a new 1/2 day option to some of our beginner camps this year. We have fun-filled learning activities involving daily riding lessons, hands on horse care (grooming, bathing, etc), water balloons, crafts, games, trivia, and much more! CLICK HERE for Summer Camp Info & Registration! LOOK FOR SADDLEBACK ON CHANNEL 2 NEWS!! KJRH 2 News is doing a series on less well-known Olympic sports and equestrian is one of them. They chose to interview SaddleBack and Ashley Zilmer, owner/head trainer, and also videoed footage of one of Ashley's group jumping lessons. The newscaster found the equestrian sport so intriguing that he got on and learned to ride with the students cheering him on! It was so much fun! Channel 2 said they'll be airing the segment right before airing equestrian footage during the Olympics in a couple weeks and in a nightly news cast before the Olympics begin. What a great opportunity to promote our sport!!! Warm Welcome to Our New Trainers! SaddleBack is excited to introduce two of the newest trainers to the SaddleBack team--Kristen Dagleish and Ashley Stevens! They are currently teaching beginner lessons to new and existing students and doing an amazing job. Bio's of both will be posted soon to our website. We are so excited to have them on board!! SaddleBack Summer BBQ! Sunday, August 14th! Trainer Jessie Vallier will be hosting our summer BBQ for all SaddleBack riders, boarders, families, and staff on Sunday, August 14th from 6:30-8:30pm! This will be a fun event to top off the summer season with yummy, potluck dinner, BBQ, games & fun! Sign-up sheets & directions will be posted soon on tack room window. Come join us to meet other SaddleBack patrons and staff and enjoy the beautiful scenery at Vallier Acres just a few miles from SaddleBack! Benefits of partial lease are ability to ride lease horse on your own outside of lessons, 1st option to ride "your" horse at horse shows, extra practice rides, and discounts on both lessons and horse shows! Please contact SaddleBack at 918-408-6446, your trainer, or email ashley@SaddleBackEquestrian.com for more details!! Carsyn/Pete – Champion, Puddle Jumpers & Winner of the Jumper Classic! Courtney/Angel qualified for Year End HJEO Hunter, Emma/Karma earned multiple 2nds in jumpers, Abbie/Beau earned multiple 2nds & 3rd in OHJA Mini-Medal, & Ava/Payday won 2nd in her first show! Kenzie/Angel, Lauren H/Charlie, Siera/Beau, & Emma/Stick all also earned 2nd place ribbons in their divisions along with numerous other ribbons! Lauren S/Payday earned multiple ribbons in AC Beginners coming back strong Sunday after challenging Saturday, & Annie/Jack had a wonderful debut earning ribbons in baby Jack’s first show! Congrats on great riding and the wonderful horsemanship/sportsmanship you each portray! Reminder: SaddleBack Tack Now Open: SaddleBack Tack merchandise arrived! We have beginner packages available through our new shop SaddleBack Tack. Ovation Equistretch Chaps, Equistar breeches, and Equistar boots...ALL for $99 combined. If you are interested in new boots, helmets, breeches, chaps, crops, gloves, and show coats, please give Crystal a call or text at 918-636-9888! Some common items such as boots, breeches, and chaps will be in stock. Other items can be ordered and shipped within 7 business days. Consignment portion of the store is in the works & coming soon. With that said, if you have any equestrian apparel you or your child has outgrown and you would like to sell, SaddleBack Tack will sell it for you on SaddleBack Equestrian's website for a small commission of 20%.